Take your visit to Macon, GA to the next level when you stay at the Macon Marriott City Center Hotel, located in the heart of the city! Featuring 49,000 sq. 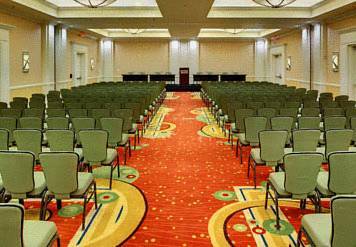 ft. of premium event space for your next conference, we are the only hotel in Macon connected to the Edgar H. Wilson Convention Center. After checking in, you will discover a beautifully decorated 4-Diamond guest room with a plush pillow-top mattress and crisp, clean linens for a restful nights sleep. Stay fit and active during your stay with our full-service fitness center featuring free weights, weight machines, and cardiovascular equipment to help you work up a sweat before your refreshing dip in our heated indoor pool. Worn out from a long day in Macon? Soothe your aching muscles in a luxurious whirlpool tub! Visitors to the Macon Centerplex Coliseum will not need to worry about transportation as we are located right next door! Enjoy a visit to Mercer University and other wonderful attractions in Macon when you stay in our centrally located hotel! Vintage Restaurant: Treat yourself to the taste of classic American cuisine served with a smile and old-fashioned Southern hospitality. An expert team of chefs carefully prepare your favorite dishes while you relax with a refreshing drink. Starbucks : Start your day in Macon with your favorite Starbucks beverage and a pastry at our hotel lobby Coffee House.